Thank you for visiting MotoFino. We are proud of our successful product line; and hope that you will see the dedication and devotion that goes into the quality scooters produced by the MotoFino family. The MotoFino Mission Statement is to provide to the American consumer the very best motor scooter at an extremely modest price. Yet at the same time provide a product that the driver would feel good about. It had to be contemporary and “cool.” And we succeeded! 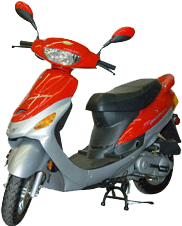 Every MotoFino scooter is “street legal” and meets or exceeds all the requirements of the National Highway Traffic Safety Administration (NHTSA) and The Environmental Protection Agency (EPA). MotoFino sells only to approved dealers throughout the US. These dealers must meet standards and be able to service the scooters that they sell. Read the latest MotoFino news. Motofino Dealer near You !